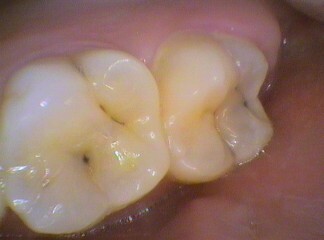 For decay to develop in the first place a formation of plaque needs to occur on the tooth surface. Plaque is a bio-film that consists of various types of bacteria and their by-products. The bacteria ferment various substances, including types of alcohol and organic acids. Decay producing bacteria ferment carbohydrates (especially dietary sugars) to produce organic acids. The more dietary sugars are eaten, the more it favours these bacteria, and more organic acids are produced, in particular lactic acid. The environment becomes more acidic which in turn favours the decay producing bacteria. Streptococcus Mutans is prime culprit amongst these bacteria, as it tends to be able to adhere to the tooth surface more easily. Lactobacillus, as the name suggests, produces lactic acid readily. MORE importantly, the acidity of the bio-film drops the pH to a level that causes the enamel to demineralise and becomes “chalky” looking. This is the early form of decay and it produces a “white spot“. The process actually occurs just below the surface of the enamel as the lactic acid can soak into the enamel to some degree. 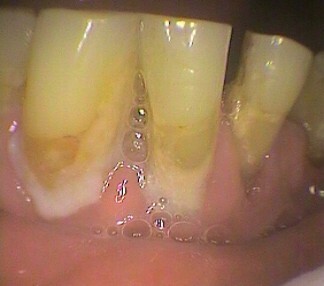 Essentially not cleaning teeth properly allows a bio-film to build up. Dietary sugars also allow the decay producing bacteria to form a “stickier” bio-film. 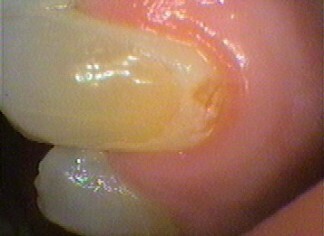 As an accident of nature, the acidity produced chemically weakens the enamel crystal structure. The bacteria initially do not directly attack the tooth, but it’s their byproducts that do. No bio-film means no decay! Regular cleaning both daily and professionally is paramount. Dietary sugars include chemicals ending in “ose”. For example, sucrose, fructose, lactose, glucose, galactose and so on. The stickier the form of sugar, the more it adheres to the tooth. The harder it is to clean the tooth because of this. Sports drinks are very acidic and actually dissolve the surface of the enamel, causing microscopic pitting. This is more pronounced with the habit of holding the sports drink in the mouth. Artificial sweeteners favour bacteria that produce alcohols that do not drop the pH and therefore do not chemically damage the enamel. Anatomy – includes deep grooves, over brushed areas, worn areas. Arrangement of teeth – crowded, impacted, tilted, over-erupted. Environment – loss of saliva protection due to caffeine, gastric reflux, medications, lip rings, tongue studs. This will be a topic of a future blog. The mouth is indeed a hostile place! The next blog article in this series will be What is Decay? After the White Spot – The Hole!